We are all people of good will, we want peace in the world. But the simple pacifism, simple rejection of violence - lack of realism. There are so much angry, nervous and intolerant people around of us . We, people of good will demand to bring the war beyond the law. But for this we need the strength to implement this law in life. We want the people world government. Only one war can be justified. This should be the last, unconditional war - a war for perpetual peace. This ring is created for those who think the same way. I joined together the Pacific and rifle sight and got this ambiguous dialectic character. 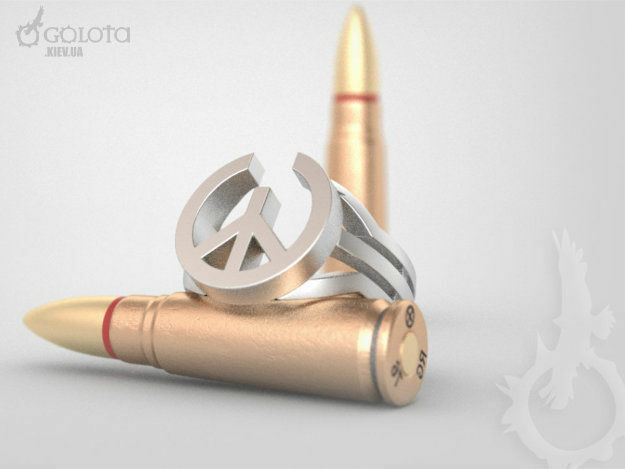 This is a ring for militant pacifists. If you need a different size options, or other material, write me.